$55.00 M 1935 Red Army Officer hat badge, 31 mm, 1935 - 1940 manufacture. Beautiful 2-piece badge in brass-plated steel and enamel, with separate, superimposed hammer and sickle. In excellent condition. 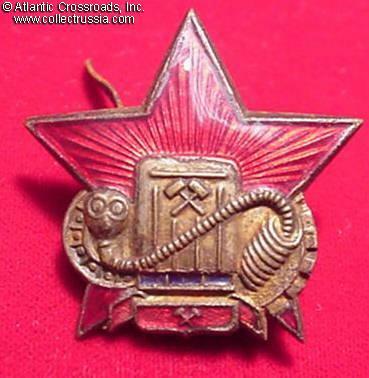 $10.00 WW 2 era Red Army hat badge for a visor hat or ushanka fur hat. Excellent condition. $14.00 WW 2 era Soviet officer or private side cap badge. $5.00 M 1941 Red Army field badge for a side cap, heavy, painted olive drab. $5.00 Army officer hat badge for a field visor hat, 1940s-60s. Heavy steel construction, painted olive drab. $40.00 M 1955 Army officer hat badge, 1950s - early 60s. Early issue in solid brass and high quality enamels. In excellent condition. $3.00 M 1969 Army enlisted man / NCO badge for a visor hat, 1970s through 1991. $70.00 M 1955 Army or Air Force general hat badge, mid 1950s - early 1960s. Nice early type in solid brass and enamel. In very fine overall condition. $12.00 M 1964 Army or Air Force General hat badge, mid 1960s through 1991. Special type cockade used exclusively by Soviet generals and marshals. $2.00 M 1964 Army enlisted man / NCO hat badge for a side cap, 1960s through 1991. $7.00 M 1955 wings for the crown of an Air Force officer visor hat, 1969-1991. $6.00 M 1969 hat badge for an Army or Air Force officer full dress hat, 1970s-80s. $12.00 M 1969 Naval Infantry enlisted man or NCO hat badge for a beret, 1970s-80s. Very fine to excellent condition. $7.00 M 1964 Navy officer hat badge, 1960s through 1991. $10.00 M 1964 hat badge in silver for Navy officer, Engineer, Medical or Administrative branches, 1970s-80s. Less common than the regular Navy badge in gold. In excellent condition. $35.00 M 1956 Police officer hat badge, 1956-57. Very scarce version of the badge showing 16 republics in the Soviet state emblem. $17.00 M 1956 Police officer hat badge, 1958-1991. $3.00 M 1977 Police officer or NCO hat badge for a side cap, late 1970s through 1991. $27.00 M 1971 hat badge of enlisted or NCO police personnel of MVD Drying-Up Tanks. This is probably most unique of all Soviet hat badges. In excellent condition. $7.00 M 1975 Police officer or NCO hat badge for a visor hat, late 1970s through 1991. $45.00 Special (Governmental) Communications, M 1978 senior officer's badge	for a visor hat, 1978-1991. $29.00 Special (Governmental) Communications, M 1978 senior officer's badge for the crown of a visor hat, 1978-1991. $15.00 VOKhR Uniformed Factory Guard hat badge, circa 1980s. In steel with silver plating and enamel. Excellent condition. $6.00 M 1984 wings for the crown of a Railroad Vocational School student visor hat, 1980s. $19.00 M 1984 badge for the visor hat of a Railroad Vocational School student, 1980s. $95.00 M 1947 Civil Aviation hat badge, 1947 - 1962. $75.00 M 1949 Merchant Fleet senior officer hat badge in bullion embroidery, circa 50s-60s issue. $14.00 M 1969 Junior Officer hat badge, Long Distance (Foreign Voyage) Merchant Fleet	. $25.00 River Fleet, M 1969 hat badge of a mid level officer, 59 mm variation, circa 1980s. $30.00 M 1965 hat badge of a senior officer in State Forestry Service, 1970s-80s. Thick version with bright gilt finish. $20.00 M 1986 hat badge of employees of the Ministry for Automobile Transportation of RSFSR. Worn among others by taxi and bus drivers in Leningrad, Moscow and other cities in Soviet Russia. In very good to excellent condition. $60.00 Ministry of Coal Mining, M 1947 senior officer's badge for a visor hat or fur cap, late 1940s -1950s. Very scarce hat badge in excellent condition.